Our Adult Partial Hospital program is for patients 18 years and older. Our program offers intensive, five-days-a-week support for individuals who need more structure and clinical care than can be provided at an outpatient level for treatment of psychiatric or dual diagnosis issues. Our new brochure details all the services provided during a patient's time at partial hospital and includes what to expect, directions, and more. 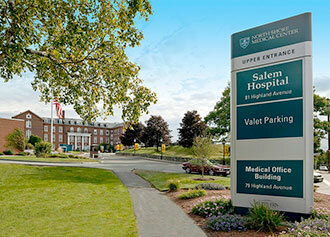 The upper entrance to the Salem campus is on Highland Avenue (also called Route 107). The entrance is at the top of the hill, at a light. As you enter the campus, bear right and up the hill at the fork. In front of you is the original Salem Hospital building, where the Partial Program is located (this building is named Axelrod). Patient parking is located along the perimeter of that oval lot. More parking is available behind Axelrod; follow around to the right of the building. As you enter Axelrod turn RIGHT and head down the hall, looking for elevators on the right. You may take the elevator or the adjacent stairs one flight up to the Partial Program. Stephanie Ferraro, N.P., Supervising N.P. Katie Rand, N.P., Staff N.P.